Dark matter is the elusive, invisible substance that appears to make up more than 80% of the total mass in the universe — far more than accounted for by the “regular” matter that makes up things like stars, planets and everything astronomers can directly observe. 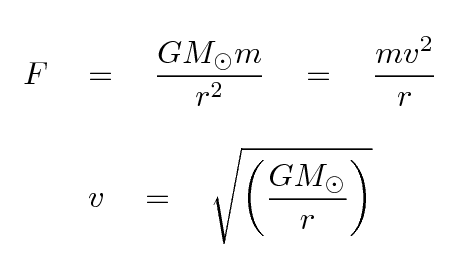 The existence of dark matter can be explained by galactic rotation curves. A big spiral galazy such as the NGC 6744 looks very much like it is rotating and that is because it is. 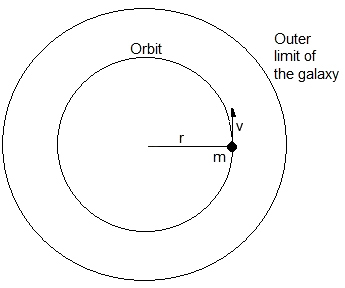 it is not possible to see this rotation if viewed edge on, but one side of the galazy will be coming towards the Earth, and the other is moving away. This causes a different Doppler shift in spectral lines from light coming from the two sides enabling astronomers to calculate the speed of rotations and from the speed it is possible to calculate the mass. Choosing stars at different distances from the centers of the galaxy, we expect that once we get beyond the central part of the galaxy, the speed of stars should get less as distance increases. We can show why this is using Newton’s law of gravitation. However, as scientists measured the Doppler shift for stars that were in the main part of the galaxy, they found that the velocities don’t match their prediction. In fact, the velocity of the stars on the outskirts was far too big suggesting that there is a lot more mass there than scientists can observe. One explanation for the rotation curves of galaxies is that there is a lot more mass in and around the galaxy than scientists can see. This is called dark matter since, unlike stars, it is non-luminous. Scientists can, however, see its effect on the stars and gas. Measurements show that there must be about five times more dark matter than the matter we can see. The problem is that, because we can’t see it, it is difficult to say what it is. Two interesting possibilities are WIMPs, Weakly Interacting Massive Particles, or MACHOs, Massive Compact Halo Objects. WIMPS are like neutrinos in that they hardly interact at all with the regular particles of matter, baryons. On the other hand, MACHOs constitute of black holes and brown dwarfs that could be present around the outside of a galazy in the form of a halo. Very interesting. I always love reading about stuff like this. Very good post! Keep it up!! Prof! 🙌 . I was fascinated by the ease with which you explained some pretty complex concepts. Nice post. Really educative! It is! It accounts for 80% of matter in the Universe! Enjoyed the article on Dark Matter. Love me some astrophysics.